Upon landing into Austin, TX Dem quickly caught me up on a significant part of history in my opinion I'd missed out on. I'll be the first to admit that I am not as knowledgeable as I would like to be on politics, which is definitely noticeable in a city like DC. Until Thursday, I wasn't familiar with Ann Richards... but now I am. As is true for many people, Ann Richards was someone who was really instrumental and important in TX's life... serving as her inspiration in many ways... part of what drew her further into an interest in politics... part of what led her to go to Baylor... at the airport, TX Dem purchased a paper so we could read the feature article detailing her life, her accomplishments, her story. It didn't take long at all for me to understand what it was that made her so special ... her important role in history, the far-reaching impact her life had, and why she was such an inspiration to many. It's amazing how someone so charistmatic and determined can easily fall off the radar of others. I feel blessed to have learned so much about her in such a short period of time. The viewing was at the Capitol building on Saturday and Sunday, with the memorial ceremony being held today. TX, Laura, Katherine, and I went before going to the ACL concerts. Having only just become familiar with Richards and her inspirational life, it was an honor to be able to be part of something so important in Texas history and to be able to join in by paying my respects as well. 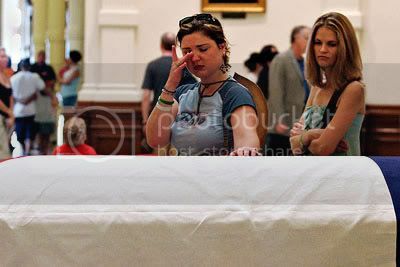 While at the casket, a photographer with the UT press snapped a photo of TX with me in the background. I think it summarizes the reach her life had... and I know it means the world to TX to have been able to be in Texas to be able to be there in person. Click here to read the full article about Richards' life. She truly was an amazing lady.